Have you ever wondered what it would be like if you met all of your personas? Interactive's game, So Many Me, lets you experience just that! While they aren't exactly your personas, they take on the role of them. 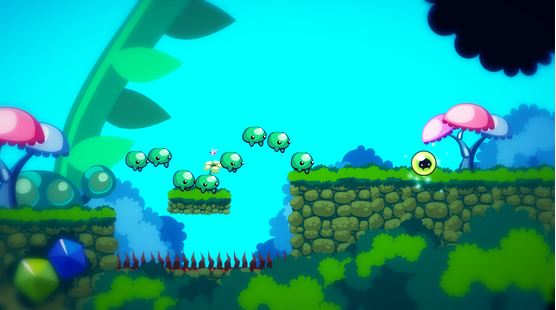 So Many Me is a platformer with an interesting twist. You can use your personalities to help you through each level, but it can be quite difficult! So Many Me is about a character named Filo. Filo has a major sense of adventure, and he seems to crave to become the typical hero. After running into a ghostly guide named Asimov that seems to guide him, Filo begins his adventure. Filo finds a small seed, and when he tries to eat it, the seed turns into a copy of him named Me too. Me too happens to have a mind of his own. After some basic movements, they discover they are connected in a telepathic way. For example, when Filo jumps, so does Me Too. This game isn't like any that I have played before, and I've played quite a few platformers. When you press X on your controller, you or your friends turn into a stone, or other various transformations to help you through the puzzle. Not only that, but you have these bigger transformations that merge all of you together to create a bigger character when you connect the dots. There are also more fun features, like skins. You can make your Me look like anything from a bird to an alien. Some skins don't change the shape of your Me, but the look. For example, you can get skins like Baby Blink, Mr Franky (Frankenstein), or Darumasan. Abilities are also unlockable as you continue. Some of which are very helpful, like the ability to have rockets pass through you, or giving your bird transformation a helmet to deal with ceiling spikes. While this game may look like a kid's game, it's actually quite challenging. Towards the end of the game I found myself rage quitting a few times. Bosses and collectibles become much harder to beat and acquire as you advance. The story is fairly basic though, you rescue a damsel in distress then save your friends and the world. 3xTiNcT, Skype, Noobert and 1 other person like this.